The Bruin Kiosk manufacturing process starts with design. Input from our customers is used to develop the industrial design. The industrial design or concept renderings are reviewed, modified as needed, and signed off by our customer. The render is turned into CAD files and submitted to our fabricator for input. The fabricator offers suggestions that may lower cost, speed delivery, or strengthen a design. The process used to generate these prototypes allows us to incorporate input from the fabricator and assembly personnel to help develop a kiosk that is easy to assemble and service in the field. Our fabrication partner has a high capacity factory located close to our facility. The fabricator has years of experience with a complete range of machining and sheet metal operations. 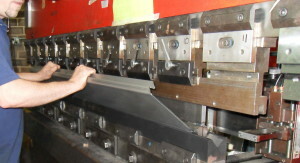 The use of a fabrication partner gives us access to “lights out” production machinery with helps drive down your costs. We benefit from the skill level of their veteran employees. The powder coat facility is also located nearby. 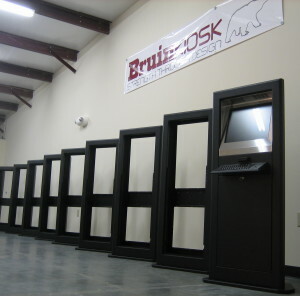 Your kiosks frames are built by a company with great expertise that specializes in sheet metal fabrication. We feel this produces a higher quality product that in house production by a company whose expertise is in other areas. Standard kiosk models are stocked in our facility. The design of our kiosks allow us to integrate a large variety of components without making frame modifications. Our standard and custom frames are assembled and integrated using lean manufacturing principles. Our shop floor is a pristine environment that has conditioned air. The work area has more the feel of an office than a factory. Our tools, parts, and work areas are organized visually to drive quality centered manufacturing.